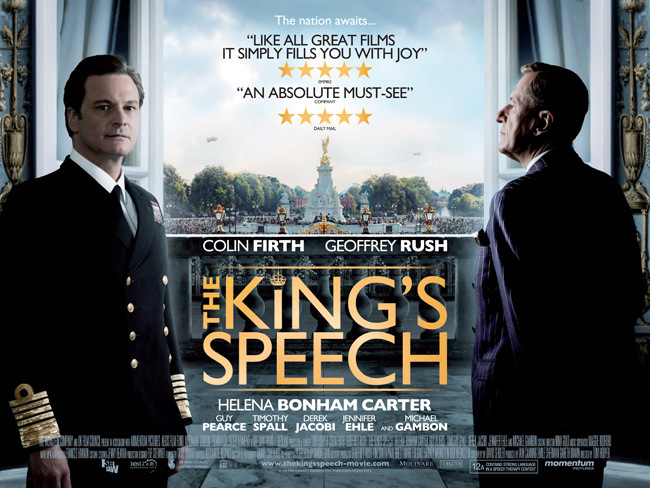 In case you’ve not already heard The King’s Speech is a costume drama based on real life events around the end of the reign of King George V, King Edward VIII time on the throne and George VI reign up to the outbreak of World War II. It’s focus is not the abdication, death or build up to war – the main focus is on Bertie (the Duke of York later King George VI) and his battle with a debilitating stammer that affects his public and private life. The top class cast give excellent performances. Colin Firth as Bertie is excellent throughout and deserves awards. The stutter alone should be award-winning; it’s not a comedy stutter but a thoroughly believable affliction with variation and nuance. Geoffrey Rush creates a radical specialist in speech impediments who would rather succeed in treating his patients than in business. A man who has little time for pomposity or position and so manages to become Bertie’s friend. Helena Bonham Carter’s Dutchess of York/Queen Elizabeth works because she doesn’t try to play the part as likable but as a snob who is quietly driven to cure her husband. Michael Gambon has only a couple of scenes but manages to convey the weight of George V sitting on Bertie’s shoulders. Guy Pearce’s smooth bullying Edward VIII is a similarly strong performance. The supporting cast includes Derek Jacobi’s Archbishop Cosmo Lang, Timothy Spall’s slightly odd Winston Churchill, Jennifer Ehle’s Myrtle Logue and many others turn in excellent performance in supporting roles. The costumes, sets, locations and other technical work is outstanding. The inspired use of bad weather allows external scenes without the modern London sky line encroaching – thick fog in the street when the Duchess of York first visits Lionel. Fog again when the Duke and Lionel go to the park and rain on the way to the palace. Despite large sections being set in London its refreshing that the capital’s landmarks aren’t splattered all over the film as cheap window dressing. Some people may not like the way aspects of history of the 1930s time such as appeasement, the abdication and the great depression are brushed over. The film isn’t about those aspects, it’s about a man overcoming a stammer and a situation he can’t simply walk away from. The King’s Speech is at times dramatic, poignant, funny and human. It reminded me in places of the West Wing’s relationship between President Bartlett and Dr. Stanley Keyworth that began in episode Night Five. The central relationship between the miserable King George VI and the theatrical Lionel is entirely believable. The use of a training montage amused me as we see some of the techniques Lionel uses. The film’s most astonishing moment has to be pulling off the reading of a long minute speech as a climax with. All Firth’s hard work in creating the stammer through the film allows tension to be maintained throughout what is basically one person reading a speech written by someone else from a script. If The King’s Speech had been released here a few weeks ago it would have topped my Top Films of 2010 list.